"This pork tenderloin soaks up the yummy juices as it cooks. And the juices are healthier in this version of the recipe because we replaced the dry onion soup mix with fresh ingredients." 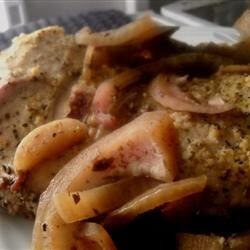 Place pork tenderloin in a slow cooker with sliced onions. Pour water, wine, and soy sauce over top, turning pork to coat. Spread garlic over the pork, leaving as much on top of roast as possible. Sprinkle with pepper. Cover and cook on Low setting, until pork is slightly pink in the center, about 4 hours. An instant-read thermometer inserted into the center should read at least 145 degrees F (63 degrees C). Serve with cooking liquid on the side as au jus. This recipe is a healthier version of Amazing Pork Tenderloin in the Slow Cooker. Very good! Great flavor... even the onions were caramelized and wonderful! Delicious, my new easy to make dinner recipe. I added a little cayenne pepper to the pork tenderloin. My hubby loves this dish too.